Peace monuments can be found in some strange places. During a recent trip to Cardiff, Wales, a statue in the entrance way to the rather lavish Renaissance-styled City Hall caught my eye as I was visiting a collection of official buildings and public spaces. The doves and the peace symbol there suggested some sort of anti-war message or references. I then noticed the plaque, which reads, “Her soul ignited goodness on our nuclear land; The burning bush of her sacrifice and faith will never be extinguished.” But with no apparent link to historical events, the significance of this particular statue was lost on me at the time. After seeing the write-up in the Cardiff City Hall Visitor Information Guide, I began to understand how the statue and plaque are linked back to anti-nuclear civil disobedience at a military base in Berkshire, England. The text and the imagery at the monument actually are references to the Greenham Common Women’s Peace Camp and the Campaign for Nuclear Disarmament. As a Canadian visitor, I came to the monument with almost no grasp of the Greenham Common references. Since my trip to Cardiff, I have investigated and reflected on what I saw there. On the 27th of August 1981, a total of 36 women, four babies and six men set off on a march from Cardiff to RAF Greenham Common in Berkshire. The protest march was against the American ground launched cruise nuclear missiles to be located at the RAF base on Greenham Common. The site then became a world famous icon for protests against nuclear weapons. Those remarks are about 19 years of campaigning in and around Berkshire; yet, anyone who passes by the monument without reading that information guide probably would assume that it is dedicated to a single protester—much like other nearby statues, which highlight isolated individuals (such as Lloyd George). I, for one, initially had the impression that the peace monument was set up there to commemorate just one woman. (The plaque refers to “her soul” and “her sacrifice”—without mentioning the collective campaigning associated with the monument.) The collective activism and critiques associated with it aren’t made apparent on the monument, itself. At best, this monument barely hints at the Greenham Common campaign. 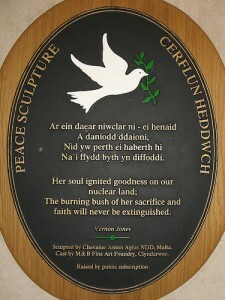 It offers little background, on its own, but this monument at least alludes to that history of anti-nuclear peace mobilizations—and in a prominent site in the capital of Wales, where the monument will have some official legitimacy. There also is a “Temple of Peace” nearby, but a monument to anti-nuclear direct action is very out of place in Cathays Park. I expect that passers-by generally would be surprised to see favourable references to radical, grassroots activism at such an official site. In any case, the historical references at the monument might not mean anything to some of the people who encounter it. Without some background knowledge or information, the statue and the plaque only will seem symbolic and mysterious. The monument is somewhat detached from the Greenham campaign, yet it also celebrates a history of anti-war and anti-nuclear activism—including the civil disobedience at the peace camp. 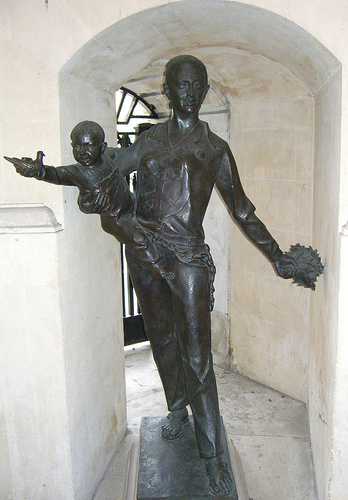 As the Cardiff City Hall Visitor Information Guide indicates, the chains around the statue’s waist commemorate the actions of 36 women who fastened themselves to the RAF base. 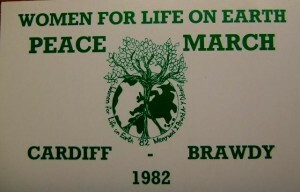 As for the t-shirt: the imagery there is a combination of a peace symbol and a tree, a design initially created for Campaign for Nuclear Disarmament (CND) activists. The Greenham Common mobilizations were loosely affiliated with the CND—an organization that has remained active. In September 1981 a mainly women’s march from Cardiff arrived at Greenham Common US Air Force base in Berkshire, where the first Cruise missiles were to be based. What was at first a temporary camp soon became both a permanent peace camp and a women-only camp. It quickly became a focus and a symbol of women’s resistance to the male-dominated world of nuclear weapons. The Greenham Women, as they became known, were independent of CND, although many individual CND women members supported or joined the camp. There was some opposition within CND and the wider peace movement to the fact that men were barred from the camp, but this largely melted away as the determination, imagination and energy of the Greenham Women became clear. In spite of press hostility and physical abuse including repeated, often quite brutal evictions, they stayed at the base, sometimes in their thousands, sometimes a few dozen only, but never giving up. As remarkable as it all was, the organizing in and around the Women’s Peace Camp site in Berkshire was not an isolated campaign. The Greenham Common mobilizations should be linked to a range of connected or comparable efforts. The 1982 New York rally against nuclear weapons is one pertinent case in point. We fear for the life of this planet, our Earth, and the life of our children who are our human future. Those links between ecology and women—if not wider feminism—relate back to the Greenham Common. At least some of the Greenham campaigners had a comparable take on ecology and militarism. 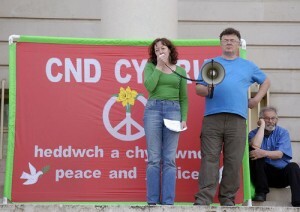 As the tree on the Cardiff statue’s belly indicates, an ecological critique was part of the protestors’ various objections to nuclear militarism. 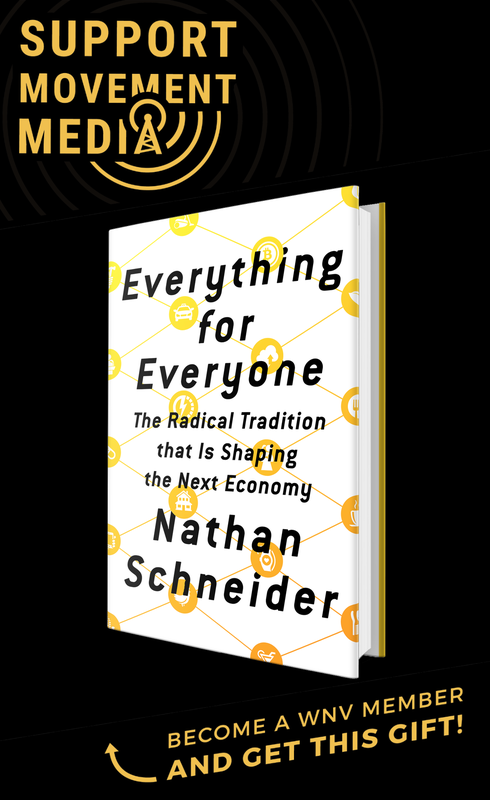 In accord with the wider Campaign for Nuclear Disarmament, and other segments of the anti-nuclear movement around their efforts, at least some of the protestors would have rejected all nuclear technologies. These findings and thoughts provide a window into the issues and history surrounding the monument in Cardiff. While raising questions about what we can accomplish through peace monuments, I hope to draw attention to an important history of activist mobilizations—which we all can learn from. Additional information is available at an online exhibition about the Greenham Common Women’s Peace Camp on the UK Imperial War Museum web site. Several interview recordings have been posted there. There is more online information on a Wikipedia page about the Greenham Common Women’s Peace Camp; and a separate Wikipedia page provides information about other peace camps.